A planned walk is set for Saturday, April 27th at the Monahans Sandhills. This is our AVA Event ID#: 112692-2019/#Y0225. Let’s meet behind the Jumburrito by the Midland Mall at 8:00 a.m., so we can caravan/carpool together. Experienced walkers should bring $3.00 and their AVA record booklets. Newbies should bring their free coupons and booklets from their New Member Packet. Saturday should be mostly sunny with temps ranging from 59 to 93! Don’t worry about trudging through sand, the walk is on a paved, park roads. Let’s go for a walk at the Big Spring State Park! The Midland Walkabout AVA Club will be meeting at 8:00 a.m., on Saturday, March 9th (behind the Jumburrito at the Midland Mall for those interested in carpooling or driving in a caravan to the Big Spring State Park. Saturday morning should start off chilly, but then it should be decent later on — not like the past couple of days. After the 5K or 10K walk, a group will probably eat at one of Big Spring’s fine establishments before heading home. Experienced members please bring your $3 and record booklets. New members should bring their packets with the free coupons and we’ll help you figure out the rest. Extra new member packets will be available if anyone would like to join. Welcome to our newest member, Bob Hays!! Big Spring State Park Info: The State Park is contained within the city limits of Big Spring. 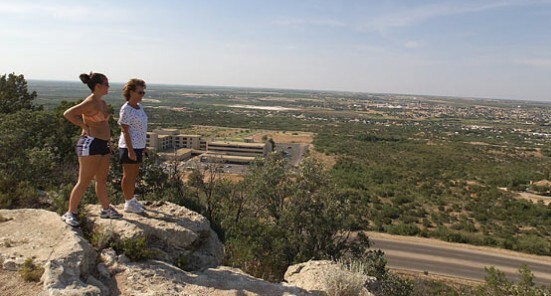 The walk itself is probably fine for most everyone in our group, but there is a hill which gets you up high enough to overlook the fine city of Big Spring! The trail is not, however, suitable for wheelchairs, strollers, etc.. We will be walking on asphalt roads, dirt and gravel paths. There are no entrance fees. Restrooms are available in the park. I will be bringing driving directions. 1/7/19 – First Walkabout Monthly Meeting of the new year! Our first Walkabout monthly meeting for the new year will be held on MONDAY, JANUARY 7th, at Murray’s Deli at 6:00 p.m. Come and welcome our new president, Diana Smart, and learn more about AVA and the Midland Walkabout AVA Club. This month’s walk will be on Saturday, January 12th, at the Monahans Sandhills State Park. Plans for this month’s walk will be discussed at the meeting. Ready to start the New Year and 2019 healthy? Come and join the brave and start 2019 with the Annual Monahans Sandhills Resolution Walk/Run. This is a 5K – 10K Run or Health Walk! For those wanting to carpool, we will meet behind the Midland Mall, Jumburrito, at 7:00 a.m. to carpool or caravan with each other. Registration begins at 8:00 a.m., and the even starts at 9:00 a.m., so we need time to register and pickup our t-shirts, etc. Registration to this event can be found here. To get credit for this AVA event, please bring your $3.00 and AVA Record booklets so you can get credit. This is Event ID#: 109860 – 2018/#Y0225 – 10 km). Need directions, click here. The 2018 Midland Walkabout Christmas Party was filled with laughter, good food, enjoyable conversation, and wonderful fellowship! This year’s party had a great turnout at the Venezia’s Restaurant, with wonderful food, and such a festive atmosphere. Talk was about the upcoming walks for 2019 and continued plans to help our membership grow! Announcement of our new officers for 2019 will be: President, Diana Smart, Vice-President, Sammy Hunnicutt, Secretary, Carolyn Petersen and Treasurer, Alex Rose.